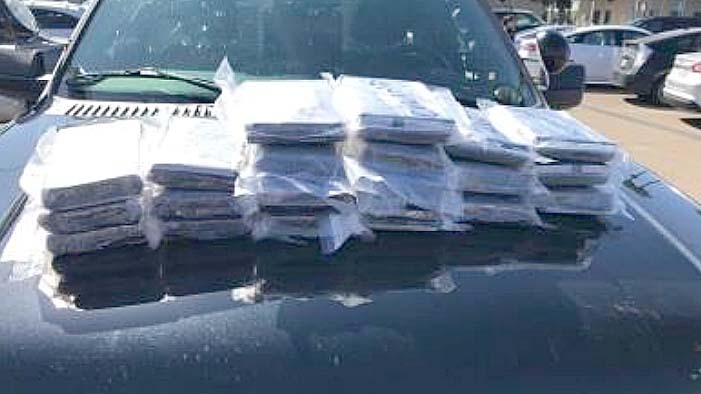 A woman and her boyfriend allegedly transporting $1.5 million worth of powdered fentanyl on an Otay Mesa freeway were charged Friday with transportation and possession of controlled substances for sale. Marilu Escamilla, 24, and her passenger, 36-year-old Fernando Camargo, were pulled over for speeding in a 2004 Mitsubishi Endeavor on westbound state Route 905 on Wednesday afternoon, according to sheriff’s officials. After a service dog alerted deputies to the presence of possible contraband in the small SUV, they searched it and found more than 20 kilograms of the drug “deeply concealed within the vehicle,” Sgt. William Kerr said. Seizures of large quantities of fentanyl, a powerful and frequently deadly synthetic opioid, have become increasingly common in the San Diego area, according to Kerr. Escamilla and Camargo, who pleaded not guilty to all counts Friday afternoon, were each being held on $750,000 bail, though a felonious source of bail hold was imposed, meaning the defendants must prove any money they use to post bond was not obtained illegally before they can be released from custody. They each face a maximum of five years in state prison if convicted of the charges and will return to court April 22 for a readiness conference.